The trunk portion of tree about one metre height from ground started leaking .All central portion of tree was lost due to this and that portion about on foot length bulged.Where leaking was taking place that blackened and powdered and never recovered to original shape.Now it is in somewhat flat shape.Remaining portion of tree is OK.The tree never flowered.The mango was brought from Mumbai and planted in Kerala.Out of 10 mango seeds only one grew.But it was disappointing. This sounds like a severe fungal infection. What you describe also sounds like it has been inside the tree for a very long time. I'm afraid there is no cure for this, and planting a new tree there in the same spot will likely result in the same problem. 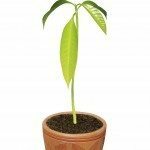 Many times planting a mango from seed will not yield the exact same fruit as the parent tree, if this was store bought. 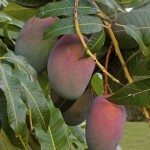 If is it locally grown, then it has a higher probability of producing the same fruit as the parent. I would recommend planting another tree FAR away from this spot. This area will not any longer be suitable for mango trees.